Deb has previously been a full time art director, and licensing coordinator for Fantasy Flight Games. She has also done a number of freelance art direction projects, most recently for John Wick Presents. She has positive, established, relationships with the artistic community and is looking for more art and creative direction work in the board, card, video game, comic, or entertainment industries. Imperial Assault - © Fantasy Flight Games, TM and © Lucasfilm LTD. Principle art director for 5 expansions, and 33 character expansion packs. Responsible for likeness accuracy, character and event cards, and sculpt concepting. Art directed 8 covers for the supplement sourcebooks for Kickstarter campaign. Principle art director for RPG core rulebook - responsible for look and feel of images under new style for company. Star Wars Armads - © Fantasy Flight Games and © Lucasfilm Ltd. Licensing and brand management with Lucasfilm team. Provided support and project management to product and executive teams. Art direction for later expansion packs. Principal art director for game like re-boot. Responsible for look and feel of character imagery. Principle art director for later expansions. Licensing and brand management with Games Workshop team. Provided support and project management to product and executive teams for various product offerings. 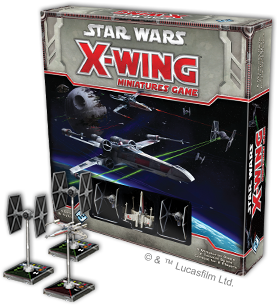 Star Wars X-Wing: © Fantasy Flight Games and © Lucasfilm Ltd. Licensing and brand management with Lucasfilm team. Provided support and project management to product and executive teams.